Rev. 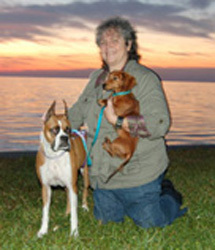 Susan R Griffin, BS, CHt, Holistic Pet Care Consultant, President and founder of Naturals for Animals, Inc., has written and published several articles on holistic pet care and the companion animal bond which have appeared in numerous publications such as The Pet Pages, New Times Magazine, Unlimited Human, and others. She has also authored “Simple Steps to a Healthy Pet”, which is now available through this site, and is currently working on a new book on building the proper relationship between you and your best friend through an understanding of canine communication and behavior patterns. Watch for it in the future. Through the years, the main difference between Naturals for Animals and other shops has been the commitment to bettering the lives of animals by educating the owners. Susan began writing books and articles when the sheer volume of information which she incurred through years of study became way too much to tell everyone in person. We hope that you enjoy and learn much the following articles and will visit us in the future as more articles are added to our site. If you have any questions, please feel free to call 727-327-2356 any day except Wed. or Sun. to talk to us in person.